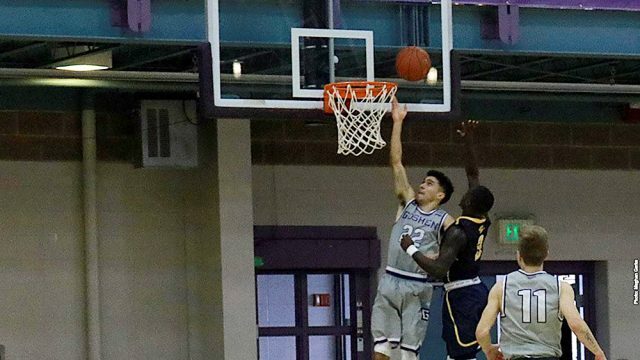 The Goshen College men’s basketball program fell to Taylor University 76-72 at Gunden Gymnasium this past Saturday to drop to 10-10 on the season and 3-5 in Crossroads League play. Devin Heath-Granger, a senior point guard, got Goshen off to a fast start, making his first five shots including three 3-pointers. GC was ahead 16-9 by the first media timeout. The Maple Leafs kept the pressure on the Trojans and eventually led 27-14 at the halfway point of the first half. Taylor would not fade away early in the game as the Trojans brought the pressure right back to Goshen, finishing the half 9-for-13 from the field. An Evan Crowe 3-pointer just before the half put the Trojans ahead 37-35 heading into the break. Crowe led the Trojans in scoring in the first half with 10 points. Heath-Granger’s 13 points were enough for the team lead, while Billy Geschke added 12 points on 5-of-9 shooting. Both teams combined for just 9 turnovers in the first half. Taylor stayed hot, starting the second half on an 18-5 run and stretching the lead to 55-44. Goshen had an answer, though, by holding Taylor to just five points over a five-plus minute span. Goshen reclaimed the lead 61-59 after a 16-5 run with only five minutes remaining in regulation. Crowe came through for the Trojans again, notching a three at the 3:30 mark to regain the Taylor lead at 64-61. For the home team, it was still just a one-possession game. Just a minute later, however, Taylor extended their advantage 68-63. With 1:19 left on the clock, Goshen held possession down just three points. Geschke’s drive to the basketball missed while Taylor’s Mason Degenkolb pulled down the carom. A quick defensive stand by the Leafs gave the hosts what came to be one final shot with 44 seconds remaining in a 71-68 game. Goshen turned to their hot hand in Heath-Granger, but the senior’s game-tying 3-point attempt was no good and the contest was all but over. Geschke finished the game as GC’s leading scorer with 23 points, while Heath-Granger finished with 15 points and a game-high eight assists. Fellow senior Conner Funkhouser was the only other Goshen scorer in double-digits with 10 and Alhassan Barrie, a junior, patrolled the glass with a team-high eight rebounds. Goshen will return to action following their road tilt against Huntington University Tuesday evening at Marian University (finished after print deadline). Tipoff is set for 3 p.m.